Winter storm “Goliath,” as it has now been dubbed, wreaked havoc in the Artesia area over the weekend, with snow accumulation totals in some areas of more than two feet. The snow began falling heavily early Saturday afternoon and did not stop until Monday, with high winds creating drifts enormous enough to bury vehicles and reach the roofs of local homes. As a result, the majority of residents were stuck indoors Sunday out of both necessity and at the request of local and state law enforcement, which were busy throughout the weekend attempting to keep motorists off the slick, ice-packed roadways. The storm has been called the worst in memory by many in the community. 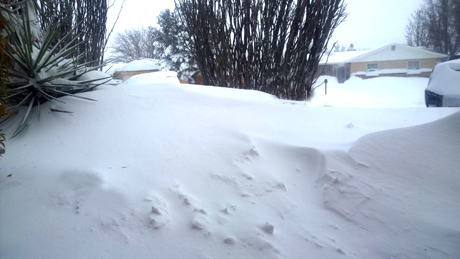 “This is certainly the biggest snowfall I’ve ever seen,” Mayor Phillip Burch told the Daily Press today. Clearing roadways was a difficult task Sunday as snowfall was unrelenting and created low visibility in many areas. Some streets in the city were cleared by Monday, when the sun peeked out to reduce some of the accumulation to slush and water. Many residential roads were not cleared, however, and with temperatures dipping well below freezing overnight, the liquid created by the meltdown quickly turned to solid ice, which continued to make travel throughout town difficult if not impossible in some areas today. “It appears by the end of today, we should have our side streets cleared,” Burch said. “Our police, fire and street crews are really focused on emergency types of situations, which means they may pass by stranded motorists to assist life and limb issues, which may be making some people upset. Many businesses in town closed Monday in order to help keep people off the streets, but by today, as returning to some degree of normal became necessary, drivers continued to find themselves stuck in thick snow or on solid sheets of ice. Overall, however, the accident rate was low, with the Artesia Police Department responding to just seven vehicle accidents since Saturday. The APD also responded to 33 public assist calls, 11 welfare checks, and five hazard calls. One incident involved a vehicle that became stuck in the snow on U.S. 82 adjacent Navajo Refining and caught fire as the driver attempted to free it. The burned vehicle had to be left in the roadway for some time, but the driver suffered no injuries. Meanwhile, as some residents were able to extricate themselves from their homes, a run on local grocery stores for supplies has left them struggling to meet demand as their supply trucks attempt to reach Artesia. “We’re out of most of our bread, and we’re running out of lunch meat, but we have plenty of water,” reported Ben Parsons, manager of Fenn’s Country Market. “We ordered multiple pallets of water beforehand in preparation for the storm. Gregg’s Foods also reported the store is nearly out of bread and milk and is hoping for a truck delivery soon. “We’re not used to dealing with this type of weather, so the only thing I ask of the people of Artesia is patience,” said Burch.